With abundant good economic news and the Federal Reserve on track for another short-term interest rate hike this month, it makes sense that inflationary forces might wake up. 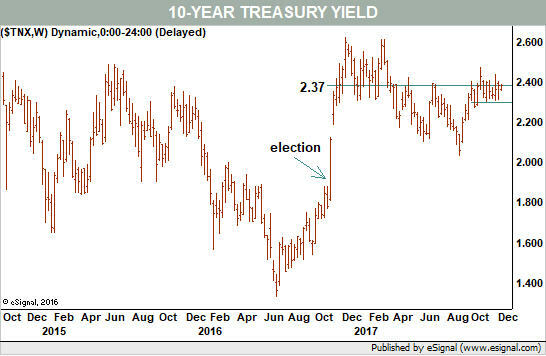 Yet one look at the bond market shows a very different story. The benchmark 10-year Treasury yield is now at 2.37%—exactly where it was Thanksgiving week of last year (see Chart 1). Even with heated discussions over tax reform, the market’s daily range since late September is quite narrow, with historical volatility at the bottom of its range since the financial crisis. Logically, interest rates, which are really the cost of money, should move higher as an improving economy demands more capital. Of course, logic is rarely a component of market analysis, and right now there are far too many indicators suggesting one outcome: Interest rates seem more likely to decline than move higher over the foreseeable future. John Kosar, chief market strategist at Asbury Research, says the futures market shows just that. The Commitments of Traders reports show that small speculators—the group that usually gets caught up in the news of the day—are betting on higher rates, while commercials—the so-called smart money—are leaning toward lower rates. In addition, an analysis of activity in inflation-adjusted bonds shows no inflationary leanings. In fact, the ratio between the iShares TIPS Bond exchange-traded fund (ticker: TIP) and the unadjusted iShares 20+ Year Treasury Bond ETF (TLT) has been on the decline most of this year. In other words, inflation-adjusted bonds are underperforming “regular” bonds. Finally, there is the yield curve, or the difference between long- and short-term interest rates. Last week, I wrote that the yield curve is as narrow as it was in late 2007. Again, that is not the usual marker of a strengthening economy, with its higher demand for money. We can debate whether than means the bond market really does think the economy is on the wrong track. The point here, though, is that inflation is still not an issue—and investment strategies should take that into account. 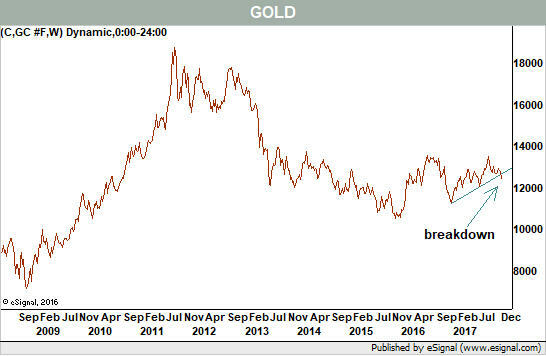 For example, last week, gold broke down below its one-year rising trendline (see Chart 2), and it remains in the middle of its trading range in effect since prices collapsed in 2013. Silver shows even weaker conditions, with a general decline in place since the middle of last year. The trend goes beyond precious metals. Crude oil showed strength over the past few months, and last month even moved above the top of the $42-$55 per-barrel range I outlined here in several columns. Overall, though, this market has been stuck in place since its 2014 collapse. So has the broader commodities arena, with the Bloomberg Commodity Index also in a multiyear flat range. If interest rates remain low, clearly savers will be the losers. Rates on money-market funds hover near 1.25%. And there will be no incentive to hedge using gold and silver. Still, low rates help companies that have high capital-funding requirements or have high levels of debt on their balance sheets, such as telecommunications. Low interest rates also translate into low mortgage rates, and that gives home builders a boost. Low rates also favor riskier assets in general, including stocks, because the rate of return far outstrips those of bonds or commodities. That means stocks still have more bull market ahead, despite the current “melt-up” feeling in the market and a greater chance a correction is getting close. Interested investors can request sample research and pricing by clicking here or by calling 888-960-0005.